Hyderabad Sep 15 (IANS) Bharatiya Janata Party President Amit Shah on Saturday ruled out any alliance with the ruling Telangana Rashtra Samithi (TRS) for the coming Assembly polls in the state and said the TRS owed an explanation to the people for imposing additional expenditure by going for early elections. Replying to a query at a press conference Shah who was here to launch the party s election campaign said Prime Minister Narendra Modi s praise of Chief Minister K Chandrashekar Rao during his speech in Parliament was in a different context and it cannot be interpreted as an understanding between the two parties. Shah said Rao had initially supported Modi s idea of "one nation one election" but he was surprised when he suddenly changed his stand. "If the TRS government comes back to power it will continue its politics of appeasement " he said slamming it for passing a resolution to provide 12 per cent reservation to Muslims and sending it to the Centre for its approval. 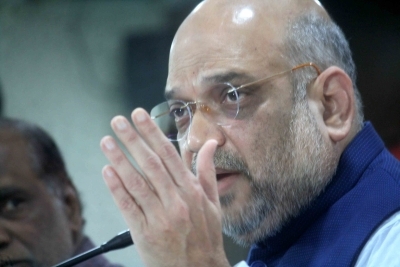 Claiming that the Modi government provided Rs.2.3 lakh crore to Telangana during the last four years against the Rs 15 000 crore given during the Congress rule Shah said the BJP showed no discrimination towards any state but was opposed to the politics of appeasement.